Venice, once among the most powerful states of the Western world, now a much-visited but still romantic city of canals, architecture and art. 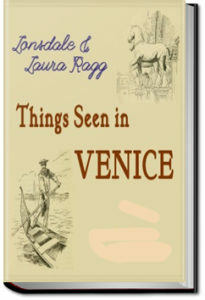 Most European cities have changed so much that a 1920 guidebook would be of little practical use, but not so Venice. Lonsdale and Laura Ragg were residents of the city – where Lonsdale was chaplain of St. George’s English church from 1905 to 1909 – and they knew it well. Their guide brings its buildings and canals, its campi and its hidden campielli, to life in a surprisingly contemporary way. Try listening to Chapter 2 as your vaporetto chugs along the Grand Canal from the railway station to the Rialto bridge, only slightly faster than it would have done a hundred years ago!